Tamales (pronounced tamallees) originated in Mexico between 5000 and 8000 BC and are considered one of the most beloved traditional foods. They have been a food staple for Mexicans for as long as history has been recorded. A tamale is made of maize (corn-based dough) and can be filled with beef, chicken, pork, chilli, cheese, beans, vegetables or tofu. It is wrapped in a corn husk (which isn’t eaten) and steamed. Traditionally, tamales are made in huge batches as a great excuse to gather in the kitchen with friends and family for a day of cooking. It’s not very difficult to make tamales, just a time consuming process. 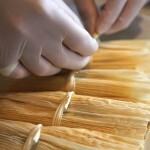 Making tamales is labor-intensive, but that’s what it’s about. The effort you put in really comes out in the tastiness of the end result. Place 15 dried cornhusks in a large bowl and cover with hot water, weighed down with a plate to keep them submerged. 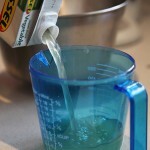 Soak until soft and pliable, about 30 minutes. With an electric mixer, beat butter until light and fluffy. 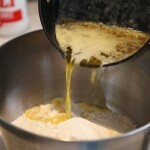 In a separate bowl, combine the dry ingredients and add the liquid. Knead dough to a smooth consistency. 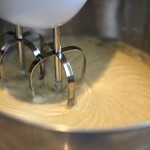 Transfer it to the bowl with the butter and mix thoroughly with the electric mixer. 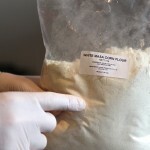 The finished dough should resemble a thick, creamy paste that is easy to work with. Cover with a damp towel until ready to use. Tear remaining 4 corn husks into 30 thin strips. Remove the husks from the water, drain in a colander and pat dry. Top each husk with 2 tablespoons of the masa dough, spreading dough into a rectangle that runs close to one of the long sides of the husk. Place one block tofu, one block cheddar cheese and jalapenos to taste down the centre of the dough on each husk. I use 2 slices jalapenos, but use more or less depending on your taste. 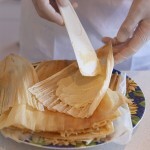 For each tamale, fold the long end of the husk so it slightly overlaps the dough. Next, roll the husk around the dough and filling. Tie one cornhusk strip around each end of the tamale. Tying the end keeps the condensed steam away from the masa and keeps the bundles intact. It also makes them look charming! To cook tamales, you will need a large steamer. This can be a special tamale steamer, or an extra-large pot with a regular steaming basket in the bottom. 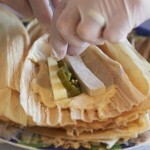 Arrange the tamales upright in the steamer basket, filling the space but not packing them tightly. 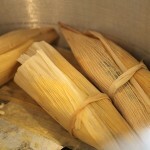 You can place a cone-shape ball of foil in the centre of the steamer basket to help the tamales stand up if you like. Pour at least 1-1/2 inches water in the bottom of the steamer. Place the filled steamer basket over the water. Bring the water to boiling. Cover and reduce heat to medium-low. Steam the tamales for around 1 1/2 – 2 hours (until the dough pulls away from the cornhusks and is spongy and cooked through). 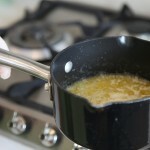 Check the water in the pan occasionally, replenishing it as needed. This will ensure the steamer won’t boil dry and scorch. 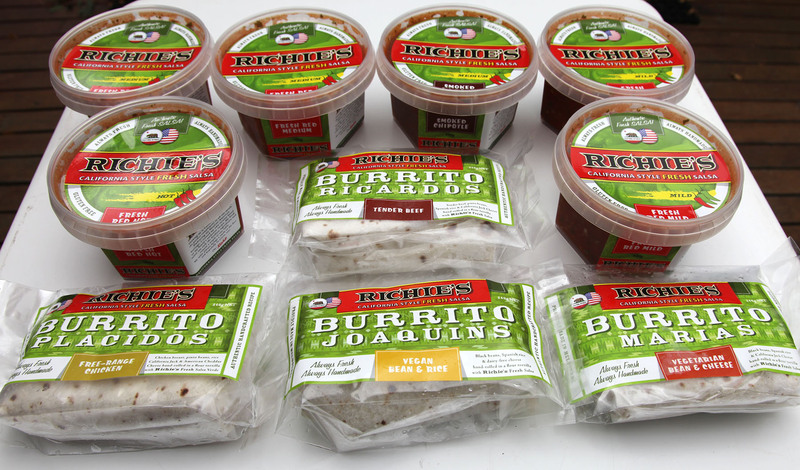 Serve tamales warm in husks with Richie’s California Style Fresh Salsa. Peel back the corn husk and enjoy! 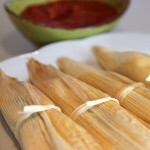 Tip: Tamales can be stored in the refrigerator or frozen in airtight container. Just reheat to serve as needed. Use your imagination when it comes to the filling – almost anything goes, from slow-cooked beef to sweet corn or even fruit.